First I would like to apologize for not having shared a recipe with you guys in a while, things have been really hectic for me the past few months leaving me with little time to devote to Spicie Foodie. But being that a brand new year is well upon us and many people are back to thinking about healthier eating or loosing those ” holiday Kilos/Pounds” , I will be sharing many of my healthier recipes or versions of recipes. 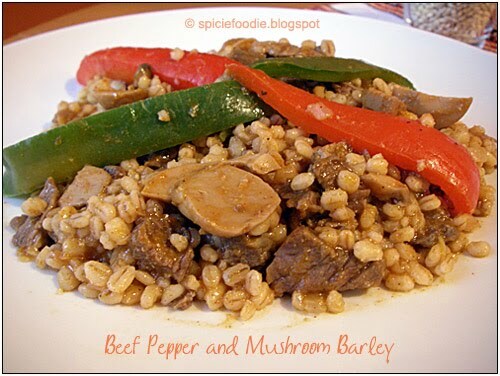 So today’s recipe is for my Beef Pepper and Mushroom Barley, not only healthy and low in calories but an extremely inexpensive meal. First some facts and nutrition information on this cereal grain , Barley. Barley is a very ancient grain that is loaded with dietary fiber which helps protect your intestines, it is cholesterol free and low in fat. Barley is high in niacin -B3, thiamine -B1, iron, magnesium, zinc, rich in antioxidants and other vitamins and minerals. The benefits list of barley is quite long and for further reading you can try these sites , Barley Food.org (many yummy recipes too), and WHFoods . Barley is a common food for livestock, it is also used for malting to make beer , whisky and some relatively unknown wine. In some latin American countries it’s ground and made into hot beverages, and even barley tea water. If you ever bought coffee substitute drinks it’s always and ingredient used. 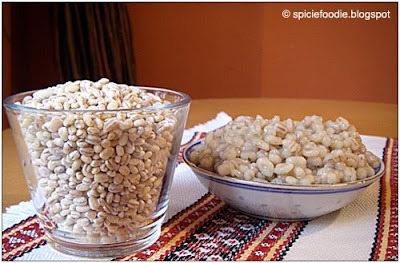 It seems some people are turned off by barley because they think it’s only good in soup, but that is not the only way to prepare it (in fact I have yet to try barley soup). I tried Barley for the first time only a couple years ago and quickly became a favorite in my home, I really liked the nutty taste to it and that it was a great alternative to rice. The first recipe I tried, a light Mushroom barley, was so good that every time I cooked it I experimented with it and have found it to be very versatile and easy to work with. 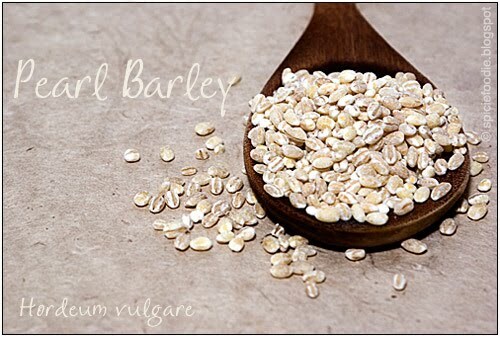 (I have several barley recipes to share with you and will add them in the coming weeks and months.) 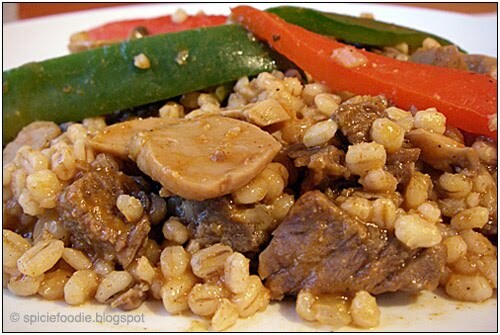 In fact this recipe is a result of every time I cooked barley my husband and I would start thinking of what else to add to it, first it was the beef and then the peppers and so on. 1. In a large pot prepare the barley by cooking it in water, follow the instructions on the bag, usually it’s 2 cups of water for 1 cup of barley. Should take about 30-45 minutes, in the mean time prepare the other ingredients. 2. Slice the beef into thin slices , and chop and slice the onion, garlic, mushrooms and peppers. In a large pot heat the oil then add the beef cook for about 8 minutes or until the beef has browned. Next add the vegetables cook for 5 minutes, then add the bouillon and spices. Simmer for about 25 minutes or until meat is soft and vegetable cooked through. (The peppers can become very soft or mushy, if you don’t like this you can add the peppers later to cook to the texture you desire.) Most of the broth will have cooked off and there should only be a little bit let, you will use it to mix with the barley. 3. 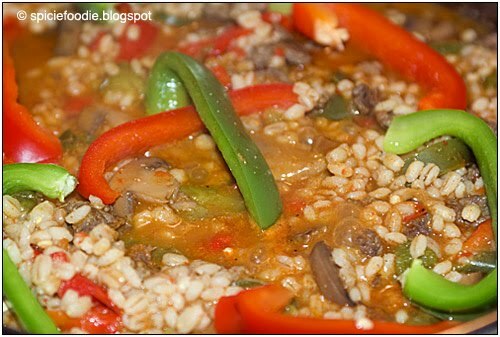 Next add the cooked barley to the beef mixture and combine all the ingredients well. Taste for salt and pepper, you also want the barley to be well coated with the paprika to give it a slight red color, so if need to add a little more paprika. Continue to cook under low heat for another 5-10 minutes to get the ingredients well combined and until all of the liquid has dissolved. 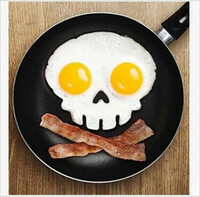 That’s all a very quick ,easy and inexpensive meal without giving up any taste! Welcome back! Let me then include more barley in my diet. Thanks for sharing. Glad you're back again. Totally understand your absence but it's good that you're back again. The dish looks warming and comforting. Very wholesome. Thank you and I hope you enjoy this recipe soon. Welcome back! I totally know what you mean about having to take some time off! It's more important to focus on living life than writing about it right? But of course, we love reading your posts! This is a great recipe – perfect for a quick weeknight no hassle dinner! A fellow blogger recently gave me the “Honesty Award.” One of the requirements is that I similarly award it to fellow bloggers. I thought you deserved it. Thanks:) and absolutely this is a no hassle dinner with all the added benefits. Congrats to you on your award and thank you for giving me the award:) Can't wait to do a post and share it with my readers.